Sydney and her little monkey are on a journey to find her lost brother who was lost during an archaeological research of the Egyptian ruins. Doing so, Sydney has woken up an ancient god who is trying to protect the temple - fight back and escape the temple. Offers a great 360-degree experience using Gear VR headset. No gamepad is required to play the game. 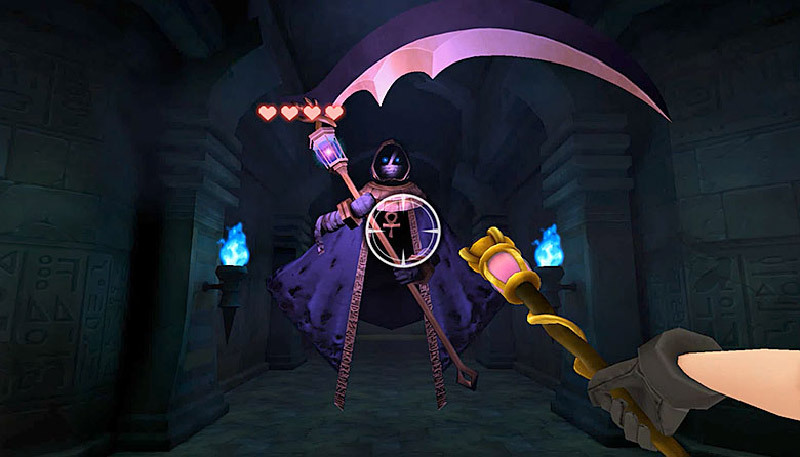 Tomb of the Golems is an exclusive adventure/action game for Samsung's Gear VR headset. You play as Sydney traveling with her little monkey pet to find her lost brother who was lost during an archaeological research of Egyptian ruins. After calling your little pal to join you and finishing the first puzzle, you go inside to explore the temple. In the next level, you grab the magic wand which you can use to shoot the scary underground creatures coming at you from all directions. You aim using the Gear VR and use the gamepad controller or the Gear VR's touch pad to shoot down enemies and beat down a giant boss. After you finish the level you get a 3-star star ranking depends on good you played the level. There is a certain mechanics that you need to learn how to take down the boss, but the it's really easy to figure out (after all, it's just the first boss). There is a total of six levels which are kind of a combination of puzzle/shooter type of gameplay, but I'll leave you to explore those levels and figure out what to do in each one. The game difficulty isn't hard, but you might die from time to time trying to figure out how the mechanics work for each level. I find the gameplay mechanics to be a bit sluggish at times. Don't expect any fast-paced shooting here. It's more about trying to figure out how to solve the level and try to finish it with the best possible score, which is 3 stars. You have a limited amount of life, after that, it's game over. You have a total of four lives (hearts), but a boss hit can consume two hearts in one stroke, or if a group of enemies is shooting at you, they can drain more than one heart at a given time, so be careful. The game has pretty decent graphics and nice mysterious atmospheric feeling to it. It's a charming little game that will keep you entertained and engaged for about an hour or more. It can last longer if you try to get a perfect score in each level or stuck trying to figure out how to finish a certain level. It's a pleasant experience overall and I think it's worth the $4.99 USD the developer is asking for it. I can just wish it would have much more levels, but the experience itself was worthwhile and satisfying. The game is compatible with the following devices: Samsung Galaxy Note4, Note5, S6, S6 edge, S6 edge+, S7 and S7 edge. Looking forward to seeing more cool Virtual Reality games from this Japanese developer, Gree Inc.
GREE has launched its own GREE VR studio in November last year. The studio raised funds of $10M and focuses on virtual reality game development, so we can expect to see many more VR games coming from this new studio. 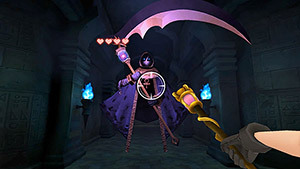 The game is fun to play and it has very nice visuals with a delightful mysterious atmosphere. That being said, the gameplay mechanics were a bit sluggish in my opinion, not as responsive as I would have preferred it would be.